Realising the significance of healthcare as a key factor to ensure overall growth of the State, Andhra Pradesh driven by the vision of Chief Minister Nara Chandrababu Naidu is steadily witnessing a real transformation in States healthcare landscape, explore Gopi Krishna Arora and Mukul Kumar Mishra of Elets News Network (ENN). Like food and water are essential for human kind to survive, so is the need of quality healthcare for them. The Government of Andhra Pradesh appears driven by this philosophy and thus working towards a grand and robust healthcare ecosystem which offers succour and strength to one and all. A look at the existing healthcare infrastructure and plethora of ongoing projects in various parts of the State, one tends to observe how seriously a Government should take health for all. More importantly, one observes how technology can trigger gigantic change in this endeavour in the modern times. With the objective to develop a healthy State, the N Chandrababu Naidu-led TDP Government has undertaken a slew of measures to provide quality medical facilities which are accessible and cost effective as well for all segments of society. Chief Minister Nara Chandrababu Naidu has reiterated on many occasions that in coming years the State would be on the top in healthcare delivery. The State healthcare system will set an exemplary role for others to emulate. From Arogya Raksha to Chandranna Sanchara Chikitsa, the Government has implemented many programmes to improve overall health of the State. The Government has adopted Public Private Partnership (PPP) mode to strengthen healthcare infrastructure in the State. Through conducive policies, start-ups have been encouraged to cater people with disruptive technology and innovative solutions. Its a transportation facility, meant for mothers who deliver at Government hospitals. It aims to provide safe and hygienic transportation to mothers to reduce MMR and IMR. A fleet of 279 vehicles are assigned for the service which is coordinated by 102 call center operating 24X7. Pregnant women are provided drop back services between 8 AM to 6 PM. Postnatal women, child and one attendant are transported from Government facility to home. To reduce the Infant Mortality Rate (IMR), all the pregnant women who deliver in public health facilities are provided NTR baby kit immediately after the delivery. The lists of items in baby kit include baby wrap, baby towel, antiseptic lotion(for hand wash of the mother) and umbrella net. CSC stands for Primary medical care on wheels which ensures availability and accessibility of medical services to the needy in remote villages. With the help of 289 Chandranna Sanchara Chikitsa(CSC) vehicles, people are catered with best medical facility to their doorsteps. Through this programme, any village with no existing health facilities within 5 km radius (12,000 identified) is provided medical services on fixed days every month with the help of Mobile Medical Units. Diabetes, hypertension, epilepsy, communicable diseases, ANC/ PNC check-ups and other common ailments are investigated and treated. To improve accessibility to quality healthcare, the state-of-the-art healthcare services are provided free of cost to urban poor and slum dwellers. Under the programme which is available 365 days, assurance of a full time medical officer, 30 diagnostic tests, supply of medicines and availability of specialist services through teleconsultancy are given. Any beneficiary who visits Electronic Urban Health Centre (eUHC) is registered in the first counter following which they receive medical consultation from the doctor. Tele-consultation is provided to those who need specialist medical consulting services including Cardiology, Orthopaedic/ Rheumatology, General Medicine or Endocrinology. This is followed by lab tests and dispensing of drugs at the pharmacy. A total of 30 diagnostics tests including dengue, malaria and TB tests are carried out here. It provides free diagnostic tests to the patients visiting Government hospitals. This enhances patient care and reduces the out of pocket expenditure for the beneficiaries. Currently, there are 105 labs in operation which includes seven mother labs & 98 processing labs spread across all the 13 districts. There are 19 free diagnostics in PHCs, 23 in Tribal PHCs, 40 in CHCs and 72 in area and district hospitals. Under this programme, tele radiology services are provided through digitalisation of X-ray film, transmission of the data through licensed software. In the remote hub, a qualified radiologist will do the study using FDA and CE approved Tele-radiology platforms and detailed report with digital signature will be sent back online to the institution. X-Ray Image taken will be converted into a digital image either through computerised radiography unit or a digitiser. The facility is available in CHCs, area and district hospitals across the state in 113 locations. Under tele radiology services, CT scan machines are installed at four locations along with the interiors and other amenities including HT power connection and power back up. Qualified radiologists and supporting staff are positioned by the service provider. All reports are generated in the facility itself by availing the in-house expertise provided by the service provider. Four CT-Scan centers at Tekkali (Srikakulam), Chirala (Prakasam), Gudur (Nellore), &Proddutur (Kadapa) are for scanning and reporting. Five tele-reporting CT Centres at Anakapalli (Visakhapatnam), Rajahmundry (EG), Eluru (WG), Hindupur (Anantapur) &Nandyal (Kurnool). The scheme is aimed to provide qualitative medical care to the concerned for treatment of identified diseases involving hospitalisation, surgeries and therapies through identified network of healthcare providers. It also aims to bring advanced surgical treatment within the reach of the poor and to improve health and medical care facilities in the underserved areas. The package would cover the entire cost of treatment of the patient from the date of screening to the date of discharge and 10 days after discharge. With a view to provide enhanced and strengthened services under DR NTR VaidyaSeva, Government is implementing 1044 (873 Surgical and 171 Medical) procedures to the poor people who are Below Poverty Line in 455 empanelled hospitals. To attain Universal Health Coverage in Andhra Pradesh, Govt. of AP has also started a scheme ArogyaRaksha for all APL families. Premium will be per head per month Rs 100/-. All the members of the family have to be enrolled. Rupees 2 lakh will be the entitlement for an individual per annum through 400 Government and Corporate Network Hospitals for 1044 procedures. The Dialysis Programme was rolled out in 2016 as part of the National Health Mission (NHM) for provision of free dialysis services to the poor. Dialysis centers have been established in all the 13 districts in PPP mode making the quality services accessible to the patients, suffered with kidney disease. There are 18 functional free dialysis centers across 13 districts. Eight Directorate of Medical Education (DME) hospitals have a total of 115 dialysis machines. It is a 24/7 emergency service for medical, police and fire emergencies. There are 468 ambulances across the State (363 BML and 76 ALS) to facilitate continuum of care from ambulance to hospital. Tab facility is available in the ambulances to ensure e-patient care record and real time reporting of emergency patient details. 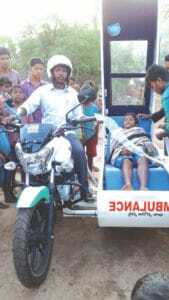 Under Tribal Reform Yardstick (TRY), a novel initiative to shift the patients from remote and in- accessible Integrated Tribal Development Agency (ITDA) areas to 108 ambulances, was initiated with feeder Ambulances. These feeder ambulances are intended to save the time taken to reach 108 ambulances and save the lives of the critical patients and pregnant women. These ambulances are equipped with life saving drugs and surgical consumables and the details of services and monitoring of fleet movement is captured real time. This program is for screening women above 30 years for early detection on seven major non-communicable diseases namely oral cancer, cervical cancer, breast cancer, diabetes, hypertension, vision, hormonal disorders. 12,000 ANMs are trained for screening for the above mentioned NCDs. Any suspected case will be referred to 57 identified referral hospitals for diagnosis and treatment. This programme aims to provide high quality eye care to affected population. 115 e-Eye centers have been established in the state of Andhra Pradesh in PPP mode. The beneficiary visits the nearest e- Eye clinic to get their eyes checked. A report is generated at the hub and treatment is initiated based on the report. Correction glasses/ spectacles are then provided free of cost on the basis of report. 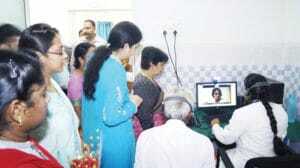 A telemedicine technology was adopted to improve rural healthcare infrastructure. Under PPP mode, a telemedicine network was established by many healthcare providers including Apollo. According to available statistics, it facilitated 18,98,170 consultations during the course of one-and-a-half years. In addition, the State Government also sought help of international bodies like UNICEF to improve the quality of services and infrastructure at the government hospitals and health centres. To upgrade the health sub-centres across the State, the Union Finance Ministry cleared Rs 5,000 crore World Bank loan for Andhra Pradesh earlier this year in February. Bio-Medical Equipment Maintenance Services aims at providing 24 x 7 service support to medical equipments in all public health facilities. The service aims at ensuring an upkeep time of 95 per cent for district hospitals and teaching hospitals, 90 per cent for CHCs and 80 per cent for PHCs. Every medical asset is tagged to an asset identification number. To reduce maternal and infant mortality in a focused manner, a cell, maternal and infant lifeline has been established. The maternal and infant lifeline aims to further strengthen the existing maternal deaths review system. An online tutorial TalliSuraksha was also launched to train all the government doctors across state. As part of TalliSuraksha, tutorials are accessible to all Obstetricians and Gynaecologists as well as PG students across the State having facility to access it from anywhere/anytime using their mobile phones or computer. It includes all major aspects affecting maternal mortality including PPH, Anemia, Eclampsia/Preeclampsia and sepsis. With the aim to ensure 100 per cent immunisation for all children in 0-5 years age group, the programme Palakarimpu was launched. The objective of the programme is to slash the death of children in the 0-5 years age group at least by half. The Government has not only taken measures to improve situation, but it has also ensured these benefits to reach lower strata of life. In totality, it can be said that the State is making giant leap to provide quality of patient care and his actions speak it all. A policy for sanitation, security, and pest & rodent control was started in June 2016 across the state covering 11 teaching hospitals, 11 specialty hospitals, eight district hospitals, 33 area hospitals, 3 MCH centers and 2CHCs. A HSMS application is used to collate various checkpoints of measurable items and is then used to generate average sanitation scores. Governmen of AP has entered MoU with Quality council of India, for accreditation of 15 Teaching hospitals under DME, AP. In the first phase the Quality assessors have visited the hospitals from 01.09.2017 and submitted the GAP analysis. In Phase II nodal officers of the concerned hospitals were given training for necessary preparation. Rs 167 crores is approved under this program fior development of hospitals. Out of pocket expenditure on health is defined as the payment made by the user at the point of service for seeking healthcare. It is one of the measures of Universal Health Coverage which means affordable, accessible and equitable healthcare. The survey is designed with a specific to capture utilisations and expenditure details of sickness or disease with special focus on chronic illness; treatment underwent (out-patient, inpatient, and delivery) with type of public or private provider; expenditure incurred against service delivery for the components like: service fee/consultation fee, medicines, diagnostics, transport, other expenditures for lodging, attendant etc. This survey was conducted in selected 26 villages and 14 urban areas across all 13 districts. Medical devices play a pivotal role in overall healthcare delivery. Only the highend technology equipped instrument can detect serious disease at initial stage. To cut dependency on imported devices and reduce the cost of manufacturing, the Government started Andhra Pradesh MedTech Zone Limited (AMTZ). It aims to put India on the global map of high end medical equipment production and make health care products affordable and accessible. In addition, A.P. Health & Medical Housing Infrastructure Development Corporation (APHMHIDC) facilitates and effective implementation of healthcare programmes in rural and semi-urban areas. The main functions of the corporation are construction & maintenance of hospital buildings. Further, the procurement and distribution of Drugs, Surgicals & Consumable and Equipment is also entrusted to this Corporation by the Government (Medical and Health Department). Looking at the overall healthcare scenario in Andhra Pradesh, one tends to observe a sincere endeavour being made to influence life of every household. Its being ensured that access to a better healthcare doesnt remain confined to the well off but it turns affordable for even the people from lowest strata of life. This is being made possible due to the State Governments positive and modern approach towards adapting technological innovations and making them integral part of the administrative system. Even in near future, the Andhra Government looks resolute to develop a healthcare-centric State which will be a torchbearer in terms of disruptive technology and innovative solutions while inspiring other States of the country to go the Andhra way.